"What a great time to be alive!" I said it out loud again sitting in my home office last night. I worked for footnote.com and saw samplings of the millions of images of historical records the company is posting on our site every month. The quantity of records, historical documents and old newspapers flowing by my desk was truly staggering. Every time I think I've found 'all' of the information that exists on my ancestors, something new is posted on Ancestry and other archival sites. Last night, I decided to look for any additional information about my 5th great grandfather, Joseph Tribble and his wife, Sarah Howard. Over the years, I thought I'd found 'all' of the records that existed about the couple, but I was wrong. 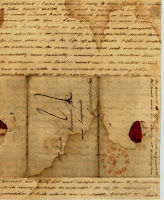 The search found a handwritten letter from grandma Sarah Howard Tribble addressed to the government as a written statement in support of a Revolutionary War retirement benefit for the widow of a veteran from Plymouth, Massachusetts. She described how she had known the widow since their youth and verified that the deceased husband had indeed been a soldier in the Contiental Army. There weren't any new facts about the Tribble family but reading the letter made grandma more than just a name and dates to me. I had found a window back in time allowing me to 'see' some of her personality both through her written words and in the unique styling of her capital 'T' and 'S'. Grandma had flair! Her lettering was carefully formed when she wrote slowly but slipped into an interesting compression as she quickly wrote the last few sentences that ended her letter. Soon, millions of images will be available on line through LDS family history libraries, from Ancestry and other similar web sites. We can find information on our ancestors quickly and easily sitting in our PJ's at home. Who can complain that doing family history research is too hard now? "What a great time to be alive!"